I wasn’t particularly excited about waking up at 3AM, especially when it took us nearly nine hours to get to our accommodation, Toraja Heritage Hotel, all the way from Makassar. This was followed by a packed one-day itinerary ticking off the must-see sights of Tana Toraja, the cultural heartland of the Torajan people known for their dramatic architecture and extravagant funeral customs. 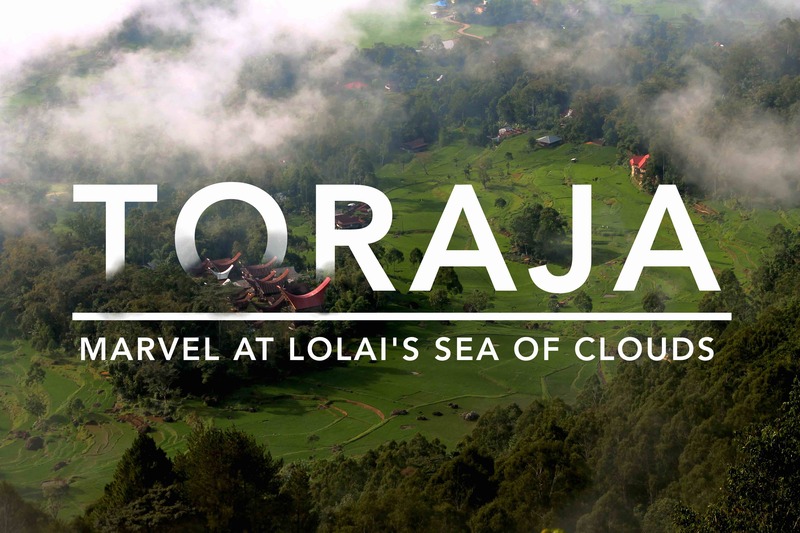 But the idea of catching Toraja’s best sunrise over a sea of clouds at Lolai, a mountain village 20 km away from Rantepao, battled my grogginess and I enthusiastically boarded the van we chartered for the pre-dawn trip. Located 1,300 meters above sea level, the village has earned the moniker “Land Above The Clouds” for its exceptional morning views, which has become popular tourist attraction only in the last couple of years. Waiting for the sunrise at Lolai village, near traditional Torajan houses called “tongkonan”. Where’s the sea of clouds? We arrived at Lolai in half an hour, climbing up an unpaved road that rocked us back to sleep. We walked up to the viewpoint, passing through tongkonan houses and alang rice granaries with their high-pitched saddleback roofs. It started to drizzle. Their silhouettes were distinctive in the misty dawn, lit by floodlights. Beyond the houses was a muddy clearing that dropped off to a cliff, the depth of which we couldn’t determine because of the thick, milky fog. There were piles of earth dug out for the foundations of what seemed to be a future viewing deck. We waited for an hour for the fog to clear, but to no avail. It was cold, but I had a jacket on and a handwoven scarf from Lemo village wrapped around my neck. Unfortunately, the fog was so thick it totally obstructed the sunrise. By 6am, I lost hope and walked back to the houses and took a nap underneath one of the rice granaries, where a mat was set in place for guests to rest, while the rest of the group drank coffee. When it seemed like the clouds weren’t clearing up anytime soon, we finally decided to return to the hotel. It was unfortunate, as I felt we woke up too early for nothing. Nonetheless, I was looking forward to catching up on sleep upon returning to the hotel, and have a proper breakfast. As we drove down the mountain, the clouds began to clear, offering views of Rantepao town. We found another viewpoint on the way down the mountain. As we drove down the mountain, we could see the clouds suddenly thinning out, revealing the buildings of Rantepao’s town center in the valley below! The hilltop crucifix, a popular landmark in Toraja Utara (North Toraja), stuck up through the layer of clouds. We immediately pulled over to photograph the view unraveling, and decided to return to another viewpoint we passed by along the way back. From here, we could see the clouds slowly pull back from the forested mountain slope, and begin to dissipate under the warmth of the rising sun. Through the holes of the clouds, we could see patches of the lush countryside, a sea of paddy fields dotted by the rusty iron-roofed tongkonans, which looked like boats floating on a green sea. And, now and then, the summit of Mt. Rantemario would peek above the densest layers of clouds rolling by in the horizon. We may not have caught the perfect view from the top, but the vistas we caught on the way back were a wonderful surprise, and ultimately, made up for the wake-up call. The clouds were finally starting to clear! Through the clouds, we could see lush paddy fields dotted by tongkonan houses. Lolai Village was a 30-minute drive from our accommodation in Rantepao, Toraja Heritage Hotel, a beautiful, sprawling mountain resort with tongkonan-inspired accommodations, a restaurant and outdoor swimming pool. Room rates start at IDR 950,000 (PHP 3,611, inc. tax and service charge) for a double or twin room, inclusive of breakfast. For other places to stay in Tana Toraja, find discounted rooms here.